Polaris still delivers amazing Side by Sides year after year. 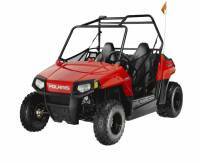 Whether you are looking to play hard or work hard, Polaris offers something to fit your needs. Extreme Metal Products is here to make sure you have all the accessories you need to not only make your machine look great, but to add durability as well. The RZR XP900 has a style all its own, and a great ride to back it up. Here at Extreme Metal Products, we have brought you the latest and greatest products to make your ride an amazing experience. Our one-piece UHMW skid plates, rocker knockers, windshields, tops, mirrors, and Outback brush guards will make your RZR XP900 look as awesome as you are. This limited edition Polaris UTV has taken the RZR to an even higher level with its longer wheel base and improved suspension and handling. With the EMP custom aluminum top, windshield, spare tire rack, and new front fender extensions, you can have fun and be safe while riding in extreme style. The narrower RZR 570 is geared toward the UTV rider who is looking to get through tighter trails, but with all of the original RZR’s power and performance. EMP offers tons of products for this machine as well, such as radiator guards, full, half, and flip up windshields, doors, and so much more. When the RZR 4 came out, it offered the chance to take even more of your friends out with you to experience all of the fun of the UTV world. Extreme Metal Products offers many items to help you all ride in style, while being as safe as possible. Check out our side rocker guards, skids, full and half windshields, mirrors, and even our new arm rests! 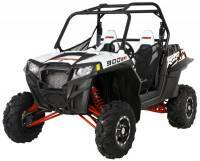 This Youth UTV has the sporty, aggressive look of the standard RZR, but with safety features and a size that make it the ideal choice for older children. Here at EMP, we designed a custom windshield to help make even the youngest UTV enthusiasts as comfortable and safe as possible. The Extreme Metal Products “Cooter Brown” line has accessories that will make your RZR even better. From stereos to storage, and our extremely popular “Cooter Brown” RZR top, do not miss this section on your trip around out site!! The RZR brought a whole different perspective to the Polaris Side by Side line up, with a more compact body style and a lower center of gravity, this UTV has a lot more attitude than most. 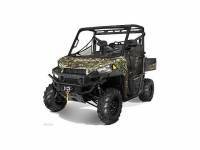 Extreme Metal Products offers many accessories that can help to protect your UTV from all that you put it through, from UHMW and aluminum skid plates, A-arm guards, our EMP bumper, and the popular Outback brush guard. We also offer inner fender guards, mirrors, and many more items for you to add safety and style to your RZR. When Polaris introduced the Mid-Size Ranger, they were able to offer a lower priced, narrower model of their already popular Ranger. Tons of people jumped at the chance to own one, and EMP began production of all of our signature parts. From our tops, skid plates, mirrors, and our new flip down windshield, to accessories like diamond plate floor boards, we have everything you need to make your Mid-Size Ranger stand out in a crowd. The Full-Size Ranger has often been described as the hardest working and smoothest riding side by side on the market. Here at Extreme Metal Products, we offer everything from the front to back bumpers, and everything in between. Take a look at our skid plates, CV boot guards, windshields, mirrors, and even our snow plow! In 2013, the Polaris Ranger XP900 began to blur the lines between work and play with its wider wheel base, great handling, comfortable ride, and superior towing capacity. At Extreme Metal Products, we were excited to make custom parts for this new addition to the Polaris Ranger line up, and we now offer full and half windshields, CV boot guards, our EMP front and rear bumpers, and our new aluminum top.